The analysis of a rock structure should not start without first preparing a complete statement of the factors involved. These usually include the geometry and intended purpose of the structure together with the main elements of the rock engineering matrix described previously. That is, the structure of the rock, mechanical properties of intact rock materials and the discontinuities, the nature of water and stress conditions in the mass and the proposed construction/excavation method. It is not usually possible to take each factor into full account, so that analysis is often based on simplified mathematical or physical 'models'. The choice of simplifying assumptions and the errors that these assumptions are likely to introduce are matters for engineering judgement, and it is often advisable to check a design by carrying out more than one type of analysis wherever possible. 'Failure' of the structure needs to be defined (e.g. excessive displacements) and potential failure mechanisms need to be identified so that design calculations are addressed to these specifically. The adequacy of the initial design can be checked by instrumentation and monitoring and modified if necessary. Design methods for the stability of the rock structure consider either the resulting stresses in the surrounding rock or the displacements which are induced or which become kinematically feasible, e.g. wedge failure on joint planes. In applying methods of stress analysis, judgement is required in deciding whether or not the rock should be regarded as a continuum, and then whether as an infinite space or half space. Various conditions of anisotropy and of inelastic behaviour can be simulated with some models. In discontinuous media, methods are available to analyse the displacements, provided parameters describing rock joint behaviour can be determined. A useful first approach is design by 'rule of thumb' using design principles that experience has shown to give satisfactory results. Where no precedent exists simple rules can be established by undertaking a programme of field observations to determine relationships between 'cause' and 'effect'. This is more likely to succeed if it is preceded by an attempt to establish, using theory and simple methods, those parameters that might prove fundamental to the design, and the trends to be expected.9 80 Empirical design rules are usually only safe to apply in the context for which they were originally formulated, and extrapolation can be unreliable, particularly if the method has no theoretical basis. An example of empirical methods based on precedent practice is the classification of rock in relation to support requirements for underground openings, namely the Q system, RSR and others (see section 10.3.1). computer analyses that afford greater flexibility, require fewer simplifying assumptions and less preparation time, and can also solve inelastic problems. Photoelastic models, however, can still be useful in presenting a visual and easily understood representation of stress distributions, and can cope easily with complex geometrical configurations. Inelastic physical models and block models to study displacements are built from materials chosen, according to principles of dimensional similarity, to scale-down prototype properties such as density, strength and deformability.82 Physical models have been used, for example, to investigate the behaviour of rock slopes, underground excavations at various stages of construction, and subsidence above mine workings.85 Gravity can be simulated by building the model lying on a flat surface with a movable backing sheet which can be drawn in the downward direction: the friction forces on the blocks simulate gravity forces. Such models are known as 'base-friction models'.84 Simple and approximate physical models can be valuable at the early stages of analysis in helping to visualize possible kinematic mechanisms and in formulating the problem, but care is needed to select appropriate scaling factors. 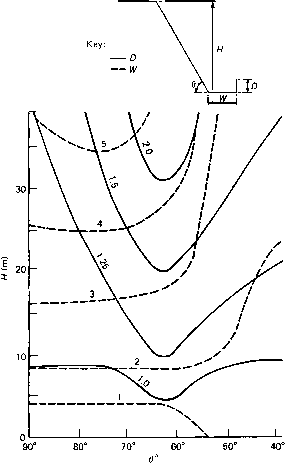 Analysis of stresses, strains and displacements based on principles of classical stress analysis and continuum mechanics88 assume that the material is continuous throughout and that conditions of equilibrium and compatibility of displacements are satisfied for given boundary conditions. The constitutive equation, i.e. the relationship between stress, strain and time for the rock mass, must be known or assumed in order to formulate the problem. This relationship can in theory be established by testing, although in practice, tests serve only to measure the parameters in an idealized constitutive equation such as one of linear elasticity. A satisfactory constitutive equation should account for rock behaviour both before, during and after failure in intact material. In most rock structures, zones of fractured rock can develop owing to the induced stresses exceeding the rock strength (zones of 'overstress') which, because they are confined by unfractured material, do not lead to collapse. It is important to recognize when it is or is not reasonable to assume that a problem may be analysed as a continuum. The presence of fractures or discontinuities does not invalidate the premises of continuum mechanics provided that a constitutive equation can be formulated for an 'element' or test specimen that incorporates a large number of such discontinuities. Soil materials, for example, contain discrete grains bounded by discontinuities but can be tested in this way, thus allowing continuum mechanics to be applied to soil problems. Having formulated an appropriate equation for the material the problem is solved taking into account the geometry and boundary conditions for the rock structure, and ensuring that conditions of equilibrium and compatibility of displacements are satisfied. Particular solutions which are most useful in considering tunnels or underground openings are those for circular holes in stressed elastic media. Equations for analysing thick-walled cylinders or circular holes in an infinite elastic solid (Kirsch equations) will determine the radial and tangential stresses around the surface and within the rock and the displacements surrounding the opening.8' A wide range of exact or 'closedform ' solutions are available for solving two-dimensional problems of various geometries, particularly for linear elastic behaviour, but few solutions have been formulated for three-dimensional problems. Boussinesq and Cerruti give solutions for normal and shear point-loading on a three-dimensional elastic half-space that can be used to build up, by a process of simple superposition, the distribution of stresses and displacements for any system of applied loads.90-" Savin'2 gives closed-form solutions for stress concentrations around holes in an elastic plate; these and other solutions are reviewed by Obert and Duvall." In practice, it is unnecessary to derive solutions to particular problems because published collections exist of most analytically tractable problems. Such a collection by Poulos and Davis94 is most thorough. It is important, however, to ensure that an appropriate solution is being applied to each design problem. For many design problems in rock mechanics it is necessary to seek a more detailed understanding of stress distribution than can be obtained by superposition of standard analytical solutions. Conditions of complex geometry, rock mass anisotropy, nonlinear constitutive behaviour and nonhomogeneity require more versatile methods of solution. To solve the many stress analysis problems for which no solution in closed form is available one must resort to numerical approximation methods for solving the continuum mechanics equations. 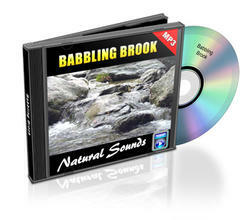 These methods are now widely used since computers have become generally available. There are two categories of computational methods of analysis, namely differential methods and integral methods (see later). For the first of these the problem is divided up into a set of discrete elements and the solution based on numerical approximations of the governing equations, i.e. the differential equations of equilibrium and the stress-strain-displacement relations. The finite difference (relaxation) method90 has had a long-established use in civil engineering. Partial differential equations that define material behaviour and boundary conditions are replaced by finite-difference approximations at a number of discrete points throughout the rock mass. The resulting set of simultaneous equations is then solved. A finite difference computer program is available specifically designed for modelling soil and rock behaviour and is based on the Lagrangian method (FLAC).95 It is capable of modelling elastic, anisotropic-elastic and elasto-plastic material properties and can simulate joint slip planes. Its main advantage is in solving for large displacements and collapse due to plastic flow, and is generally applicable to slope and foundations analyses as well as underground excavations. The finite element method'*'''' is similar in many respects, except that the rock mass is subdivided into a number of structural components or interacting elements that may be of irregular and variable shape (Figure 10.16). A judicious selection of element is critical to the efficiency of computation. The elements are assumed to be interconnected at a discrete number of points on their boundaries, and a function is chosen to define uniquely the state of displacement within each element in terms of nodal displacements at element boundaries. Strain may then be defined and, hence, stress using the constitutive equation for the material. Nonlinear and heterogeneous material properties may readily be accommodated, but the outer boundaries of the model (or 'problem domain') must be defined arbitrarily. The boundary conditions, in terms of relative fixity and degrees of freedom, may influence the area of interest to the analysis depending upon how distant these boundaries can be set in the model. There are practical limitations on the number of elements used in relation to computer storage, and the elements themselves need to be well-conditioned shapes (triangles or rectangles). Nodal forces are determined in such a way as to equilibriate boundary stresses, and the stiffness of the whole model may then be formulated as the sum of contributions from individual elements. The response of the structure to loading may then be computed by the solution of a set of simultaneous equations. Finite element computer programs have been written for a variety of rock mechanics problems, to tackle both two- and three-dimensional situations, elastic, plastic, and viscous materials, and to incorporate 'no-tension zones', joints, faults and anisotropic behaviour. The method is also used to solve water-flow problems, heat-flow problems, and an even wider scope of situations unrelated to rock engineering. Analytical techniques, which are based on continuum idealization, are not always suitable for jointed rock problems. Numerical methods such as the finite element method or finite difference method in which rock masses are simply considered as elastic or elasto-plastic continua, are not suitable to model the geometric irregularity in natural jointing. Several methods have been proposed to simulate such discontinuous media. They are divided into two groups: (1) 'equivalent' continuous analyses in which the jointed rock mass is represented by a homogeneous, anisotropic and continuous medium;98 99 and (2) the methods which can deal with discontinuities directly and can express positively the behaviour of discontinuous rock masses. Finite element techniques using joint elements100 have been used in the analysis of certain problems, particularly in configurations involving a relatively small number of major faults or joints. However, for models with dense jointing, a large number of degrees of freedom are required. (1) The rock mass is simulated as an assemblage of blocks which interact through corner and edge contacts. (2) Discontinuities are regarded as boundary interactions between blocks; joint behaviour is prescribed for these interactions. (3) The method utilizes an explicit time-stepping algorithm which allows large displacements and rotations and general nonlinear constitutive behaviour for both the rock matrix and the joints. 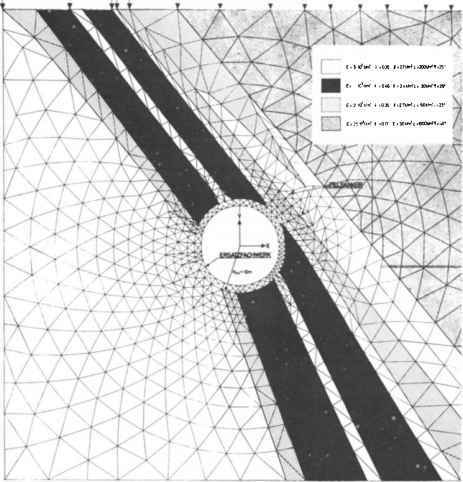 description of the method is presented in the appendices of a practical manual on underground excavations.62 This further provides a collection of stress distributions calculated using the boundary element method around single openings of various shapes within different stress fields. Reference to these is useful as a first assessment of stress concentration around proposed excavations. More recently'07 a boundary element formulation has been presented for modelling structural discontinuities, joints, faults and heterogeneous rock. The model is divided into regions, each one homogeneous, separated by interfaces which can represent discontinuities. The solution, however, is an iterative approximation to account for nonlinear joint equations. The displacement discontinuity method is particularly suited to the analysis of tabular openings (such as coalmines). It is able to work in three dimensions, data input is relatively easy, and will model multiple seam-mining layouts or folded or faulted single-seam deposits. Various coupled computational analyses (or 'hybrid' methods) have been devised to make advantageous use of the boundary element integral method for modelling the far-field region of a problem, and to couple this with an appropriate differential method (relaxation, finite element or distinct element) to model the immediate surroundings of the excavation. A domain of complex behaviour is thus embedded in an infinite elastic continuum. Lorig and Brady'0'109 have described the coupling of the discrete element method with boundary elements, and Ushijima and Einstein"0 a three-dimensional finite element code with boundary elements. In the limiting equilibrium method'" a rock mass is considered under conditions where the mass is on the point of becoming unstable. The method gives no information on magnitudes of displacement or on rock behaviour prior to failure, so that the design calculations cannot readily be checked by instrumentation and monitoring of rock movements. Slope design9 usually employs limiting equilibrium analysis. A first step is to assess whether any kinematic mechanisms of potential slope failure are likely to be more closely approximated by a plane failure, a sliding wedge, rotational slip or a toppling failure model, and to identify the beds, joints or faults that could conceivably control such a failure, as illustrated in Figure 10.18. Throughgoing discontinuities such as faults, beds or older pre-existing failure surfaces are likely to be of considerably greater significance than impersistent or rough features. The presentation and analysis of geological structure data using the method of stereographic projections (stereonets)10 is invaluable for such an assessment. Clearly, the collection in the field of the geological data relevant to the problem is of paramount importance, as described in Chapter 8.
best estimates can be used to give upper and lower bounds in the stability calculations. More rigorous calculations then require in situ measurement of shear strength or the back analysis of existing slides, water pressure monitoring and permeability testing. 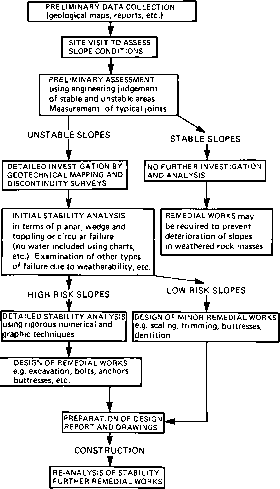 A flowchart showing the main steps in assessing the stability of a rock slope is presented in Figure 10.19. A most comprehensive practical manual' presents full details of the methods mentioned above, to which reference should be made. ring due to loosened blocks. These may be controlled by full stabilization methods, or by protection methods such as catch fences and ditches to arrest or retard the tumbling blocks. 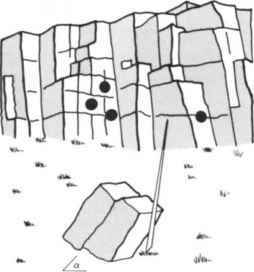 Experimental work, notably by Ritchie"4 and others,"5 has examined the trajectory of falling blocks and enabled guidelines to be developed for slope-toe rock traps. A design chart for ditch and fence rock traps is shown in Figure 10.20. Protection measures are generally not expensive but require continual maintenance, whereas stabilization measures such as rockbolt-ing, buttressing, trimming, mesh and shotcrete which may need little maintenance can be very expensive to install, especially for high slopes. Owing to the inherent variability of the orientation of discontinuities, even though they occur in 'sets', the design of rock slopes may in some circumstances lend itself to a probabilistic analysis. "6-"8 For example, the resisting forces are due to the shear resistance of the joint planes and the disturbing forces are due to the weight of the rock block or wedge, both of which are functions of joint orientation. Whereas normal 'deterministic' analysis is based on a factor of safety for the ratio of resisting to disturbing forces, probability density functions or distributions can be derived to describe each of these. The probability of failure is then a function of these two distributions. Rocks generally, have a high allowable bearing pressure which may be reduced by the presence of weak layers, discontinuities and weathering. The allowable bearing pressure depends on the compressibility and strength of the rock mass and the permissible settlement of the structure. Typical problems that require a more detailed study include the design of end-bearing piles or caissons carried to rock, particularly when the depth of overlying less competent materials is such as to require a minimum diameter of excavation with correspondingly high bearing pressures. The design of rock-socketed piers has been reviewed by Rowe and Armitage12' and they have produced a number of design charts for their proposed method. Piling in chalk has been reviewed comprehensively by Hobbs and Healy.122 Certain types of structure are particularly vulnerable to differential settlements, and others are particularly massive so as to impose high foundation loads (e.g. 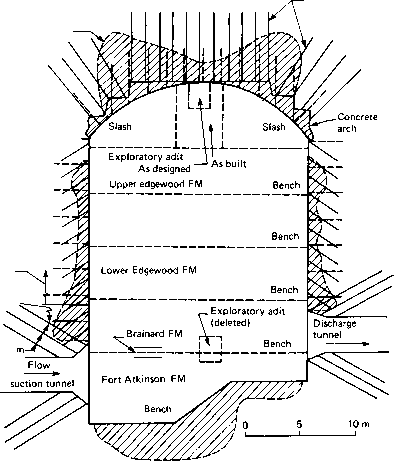 arch dams and the heavier types of nuclear reactor)120 125 and in these instances rock foundations require careful design. Site exploration is primarily aimed at locating suitable foundation levels, and the relative, rather than the absolute, competence of strata. Rock-quality maps can be useful in making this choice. The depth of rock weathering (Chapter 8) is often of particular significance. 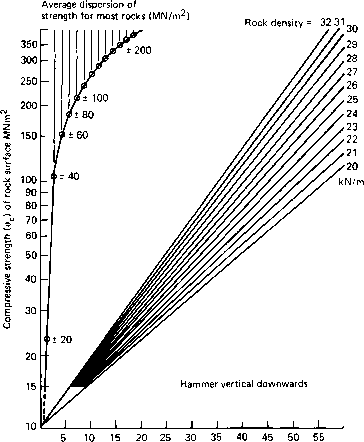 Approximate allowable bearing pressures can be estimated empirically"9 and often at this stage the foundation design can be modified or improved by grouting. More detailed analyses of foundation behaviour may employ closed-form elastic or plastic solutions or the various computational methods of analysis described in section 10.4.4. These require information of rock deformability that is usually obtained by in situ plate-loading tests or from borehole dilat-ometer tests. Seismic refraction and other geophysical methods may be useful to assess the character of the rock mass on a large scale. Foundations on argillaceous rocks can be subject to plastic deformation under high contact stresses and may require a study of long-term (time-dependent) behaviour. Stability analyses - taking into account particularly any uplift forces due to water pressure - in addition to settlement calculations are necessary when designing dam foundations and abutments, and when a foundation is situated above a rock slope. Limiting equilibrium methods are appropriate for these analyses, although rock foundation-structure interaction analyses using computational methods of analysis are appropriate for any major structures. Underground openings for civil engineering purposes require perhaps the most rigorous use of rock mechanics practice in their design and construction. They are so demanding because of the severe consequences of being unsuitable or unsafe for their intended purpose. Tunnels and caverns for, say, railway systems or hydro-electric power complexes are not only occupied by the public in some cases, but even minor instability or surface ravelling of small blocks is wholly intolerable to the function of the works. The responsibility on the designer given the natural variability of the materials is very great and it is also necessary to recognize the essential requirements of the various uses to which caverns may be put. In the above examples stability in every sense is essential but the effects on the groundwater regime may be of lesser importance. There are some caverns used for storage of water, oil or gas, and mining openings in which limited minor instability might be permissible, but to maintain, for example, an unlined gastight cavity, it is essential that drainage of the surrounding rock pore water and fissure water does not occur. The most demanding of purposes for caverns for the designer is the storage of radioactive waste, and this requirement is one explanation for the recent most rapid advance in rock mechanics field experimentation and development of understanding. Stability is essential and must be considered both for the very long term and in relation to extreme thermal effects and radionuclide absorption on rock mass properties, as well as to the dynamic disturbing forces of possible future seismic events. The prediction of groundwater flow around and away from nuclear repositories must consider the stress and thermal effects on hydraulic conductivity of joints and fissures, and the hydrothermal migration or convection effects on groundwater. 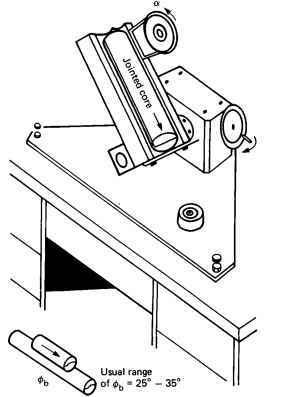 Such details can be examined theoretically using the computational methods described above, but the determination of realistic input parameters remains a major problem. The shapes and sizes of underground excavations are often dictated by economic and functional considerations, but their precise location and orientation should be adjusted to suit ground conditions wherever possible. Optimum orientation requires a knowledge of the geological structure, rock mass structure and also of the directions and relative magnitudes of principal stresses in the ground prior to excavation, and so detailed layouts of proposed works should be held in abeyance until after the investigation stage if possible. A guide to the most important steps in the stability design of underground openings is given in Chapter 1 of a comprehensive manual by Hoek and Brown62 and full details of the various methods are given. 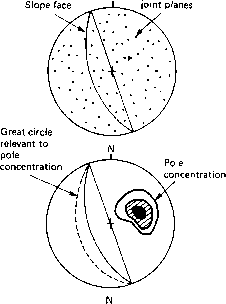 In the design process it is necessary to characterize and zone the rock mass 'geo-mechanically', to determine constitutive relations and strength criteria for each zone, and then bearing these and the proposed geometry of the opening in mind to select the appropriate method of analysis which will render where potential zones of instability lie. The criteria for support design must then be decided upon, e.g. it is common to provide rockbolts of sufficient length and number to support the deadweight of tension zones or 'overstressed' rock determined by stress analysis by anchoring back into 'sound' rock as illustrated in Figure 10.21. The definition of relevant 'failure' criteria which may be influenced by water pressure or seepage considerations, dynamic seismic forces or limiting displacements is a significant design input. Each failure state must then be tested for various stages of the excavation progress because areas of stress concentration will vary. When the excavation sequence and support element dimensioning are decided, verification of performance monitoring is necessary.